Chinook Landscaping Calgary can help you create a landscape design that gives you and your family a beautiful yard to enjoy. Our in- house landscape designer can create a detailed landscaping plan for you to help you clearly identify exactly what you want for landscaping components. Following is some ideas to consider when planning your landscape and creating a landscape design for your Calgary property. You can visit Landscaping Schedules to understand what order your landscaping should be installed. Building your landscape in the proper order is important and a well thought out landscape design plan can help you achieve that. Knowing what you want and incorporating that in to a practical design might take you a little time to do but it is time well spent. 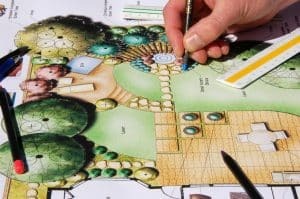 Once you start working with a rough sketch, you may see that some of the landscape components you would like to have may not work once you try to place them all into your yard. That is why at least having a rough sketch of what you want will be very helpful in creating your landscaping for your property. Do you need a professional landscape design? Not everyone needs a professional landscape design. We use professional designs for about half of the landscaping projects we install. Many of our customers prefer to see a complete professional design before they proceed with their landscaping. Others are happy with a sketch and a detailed walkthrough before we get started. If you would like a professional landscape design we can create one for you. You may or may not be aware that you can usually get a real property report or site survey of your property from either your builder, developer, or at your local records office. This is typically a to scale drawing of your lot and your house. Generally, the RPP map won't be the scale you will use in designing but transposing the scale is pretty simple. (We'll talk about scale in a minute.) More than anything, we'll use this map in landscape planning, as a design aid for accuracy, to see the "real" shape of your plot, and for locating utilities and property lines. But before you start to scribble on you RPP make a number of copies so you can try different landscaping components, layouts etc. You might mess up, change your mind, or want to do several different design variations. You probably have a number of great ideas for your landscape design, some that are practical and some that may not be. Taking a good look at your property and walking around, performing an analysis of the site will help you understand what will work and what won't work when it comes to you landscape. Be sure to take a drive or stroll around your neighbourhood and have a good look at some of your neighbours landscapes. Make notes on what you like, and what you don't like about other properties. What works nicely, and what does not work so well ? Have a look at the lay of the land, how others deal with slopes, drainage etc. What kinds of plants specimens have they used? What different tree varieties? How do the colours change from spring, to summer, to fall? Remember, Calgary has its own special climate and is suitable for a number of different varieties of trees, shrubs and perennials. Although we are limited in plants compared to other cities like Vancouver, there are still a great number of hardy plants available that flourish in Calgary. When considering shrub and tree varieties be sure to plan for the long term growth of each plant. It is very important not to overcrowd your garden and you also don't want to waste money on plants or trees that will eventually have to be removed. Visit this page to see landscaping photos. Here are some main components that are often included in landscape designs. Landscaping themes can be considered at this point. Be sure to consider the design and style of you home. Matching garden stone, walkways and patios with your home is important. Styles and themes are different. You may also have a personal passion that you want reflected in your landscaping, and it is important to make your landscape your own with your own personal touch. Google some inspiring landscaping ideas and have a look at what they are using to create their landscapes. We start the process by meeting with you at your home and we discuss your landscaping options with you. We usually spend about 2 hours getting all of your thoughts on what type of landscape you are looking for. During that time we will cover implementation of patios, walkways, decks, plantings and more. After that we create the design and then we meet with you again to discuss any changes before completing the final design. If you decide to use our company for your landscaping installation, we will take the cost of the landscape design off of your installation total.